In a small and comfy east-side Salt Lake City home, the steering committee of Transition Salt Lake has gathered over cups of peppermint tea to discuss the end of the world. For Transition Salt Lake, a budding local affiliate of a worldwide movement of community resilience and DIY skill-sharing, the end of the world as we know it doesn’t have to be all doom and gloom. The group’s particular apocalyptic fears are more left-leaning than those of some end-days groups that are fixated on the possibility of President Barack Obama ushering in a one-world government takeover. Transition members worry more about the possibility of the fossil-fuel-driven economy collapsing on itself or sparking a worldwide environmental catastrophe—or both. But Transition Salt Lake members really don’t talk much about how catastrophe will strike—rather, they discuss how they will adapt. The group has been running for a little more than a year now, seeking to exemplify the teachings created by a rural movement in the United Kingdom that, in the early 2000s, began transitioning small villages from dependency on fossil fuels and re-teaching community members the skills of self-reliance their forebears knew before chain grocery stores replaced community markets, before pluck and determination were numbed out by reality television. The Transition group looks to organizations like the Slow Food movement, Wasatch Community Gardens and Food Not Bombs as groups already in tune with building up community with sustainable survival skills. French pitched Transition Salt Lake to a 2011 meeting of Peaceful Uprising members. At 56, he’s old enough to be the father of some of the youthful activists in attendance, so he was surprised to see heads nodding emphatically and the occasional raised fist of support. French and a handful of colleagues run Transition as a project they hope will become self-sustaining. 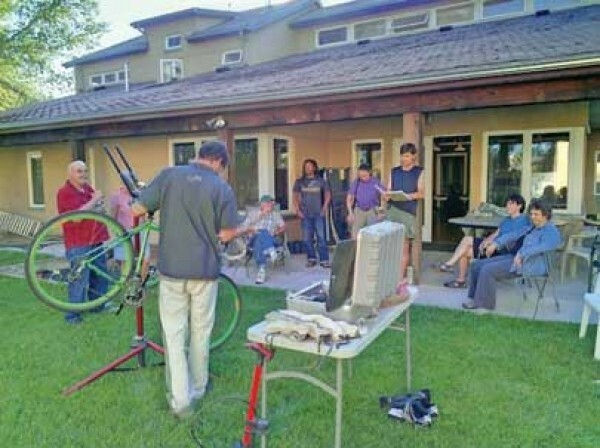 They hold meetings every other week and provide “re-skilling” workshops every month, covering subjects like making granola, building solar ovens and bicycle maintenance. “It’s about relearning some of the skills our grandfathers used to know and a few they didn’t,” says member Carole Straughn. While Transition’s unstated politics hew to the left, they share a belief that’s common among many of other political stripes that society’s political and economic systems are broken. They’ve found that educating people on the brokenness of the system is more effective when accompanied with productive skills workshops and solutions for “softening the landing,” Mates says. It’s a point of pride for Transition folk who like to distinguish themselves from the bomb-shelters and automatic-weapons brand of survivalists by emphasizing that nobody survives catastrophe unless local communities and local economies come together. “If I got food, it won’t do me any good if my neighbors don’t have food, because then they’ll just come and get it,” Straughn says. Lorenzo DiTommaso, a professor of religion specializing in “apocalypticism” at Concordia University in Montreal, Canada, says that among groups, secular and religious, the Transition model is different from the standard fixation on “the end” as being exactly that—with no life to look forward to afterward. “These people are actually looking forward to living in the post-apocalyptic world,” DiTommaso says. He also finds their lack of ideology and their community-building emphasis uncommon compared to the more Ruby Ridge-style survivalist group. “[Focusing on] environmental collapse and economic collapse … is an important change” in apocalyptic thinking, he says. “It’s a 21st-century view.” While DiTommaso says there have been other secular groups fearful of catastrophes in the recent past, he sees a possible surge in people preparing against economic insecurity since it’s a threat that hits close to home. “Although the threat of nuclear was very real during certain parts of our history, such as the Cuban Missile Crisis or probably the mid-1980s, you had no control over it and didn’t see it in action, so it wasn’t part of your daily life,” DiTommaso says. But now, with a faltering economy and stark unemployment, more groups like Transition—as well as guns-and-bunkers groups—are seeing constant reminders of the need to learn the skills necessary for survival, should the financial system collapse. The steering committee of Transition Salt Lake holds the view that the more one re-skills, the more one is also able to be independent from gas pumps and grocery stores. Ben Mates, a committee member who also serves on Salt Lake City Mayor Ralph Becker’s Food Policy Task Force, gives a tour of his already well-transitioned backyard to a reporter. There are apple, pear, two types of plum and hazelnut trees and grapevine trellises. A worm compost bin under a cluttered awning also holds a funnel collecting “tea” from the compost. A summer garden sits next to a hoop house that keeps hardier plants like a freakishly tall rosemary plant, along with other greens like chard and spinach, alive through colder months. Through the summer, he also grows tomatoes, zucchini and plenty of garden herbs. His roof is covered in solar panels and he’s got a Nissan Leaf, a totally electric car, parked in the driveway. French—who rides an electric-assisted bicycle—says some investments like solar panels can be expensive, but that prices are coming down, and the long-term advantages are vital. Transition Salt Lake will hold its November Re-Skilling Workshop, making homemade holiday gifts like candles and birdfeeders, on Thursday, Nov. 29, 7-9 p.m., at the First Unitarian Church, 569 S. 1300 East, Salt Lake City.